Everyone loves cheese scones, right? They are a lovely treat both warm and cold, and are quick and easy to make. Why not cook up this traditional favourite with an autumn twist? 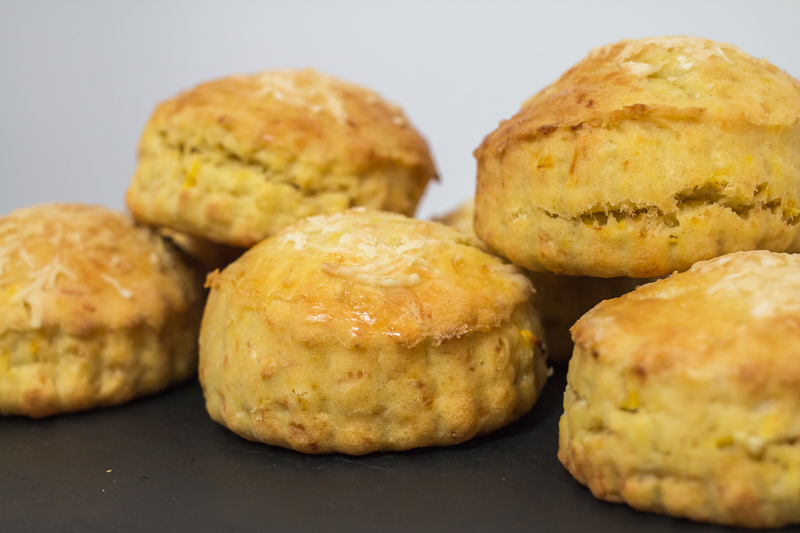 These pumpkin and cheese scones are quick and easy to make and are the perfect autumn snack for when friends pop round for tea! The pumpkin adds a hint of sweet, earthy flavour complimented by the nutty, fruity flavours of the Parmesan cheese. Cut the pumpkin flesh into cubes and layer the on the metal rack in a roasting tin with half an inch of water in the bottom and cover with foil so that the pumpkin steams. Steam in the oven set at 180C for 15minutes. Once the pumpkin has been cooked, remove from the oven and leave to cool thoroughly before blending in a food processor until a smooth purée. Preheat the oven to 200C ready to bake the scones. Place the flour, baking powder, salt and cayenne pepper in a large mixing bowl. Add the butter (cut into cubes) and rub together with the flour with your fingertips to create a breadcrumb mixture. Add the pumpkin purée to the mixture and mix using your hands until the mixture begins to come together. Fold in the grated Parmesan cheese (do this last so that the temperature from your hands does not melt the cheese) and bring the mixture into a ball. Flour your work surface and roll out the dough to approximately 2cm thickness. Using a 3-inch cutter, cut out scones and place on an oven tray. Glaze with egg wash and a sprinkling of Parmesan cheese before baking for approximately 10-15 minutes until golden brown. Enjoy warm or cold with butter!